Last minute handmade gift ideas that are great for #christmas. Easy to follow these lovely teacup candles infographic from Pinterest. If you are handy with the knitting needles and have some spare wool around why not get this free tea cosy pattern from Love Knitting on Pinterest. There are lots of easy handmade gifts all around tea which could soon be knocked up for any tea lover. These were just a few I found on Pinterest. It has inspired me to quickly knit up some of the cup cosy for my friends. It’s worth a visit to the lovely Georgian village of Easingwold to appreciate the lovely tea rooms and cafes available. The Clark’s have two to choose from, Clark’s Tea Rooms, Market Place, Easingwold, Yorkshire, YO6 3AG Tel No 01347 823143. This tea shop has all the same cakes, breads and pastries sold at their other shop ‘Clark’s Cafe’ bakery. It’s divided into three rooms with walls adorned with local artists work and a smokers parlour at the back.The position of this tea shop in the central Market Place is perfect for a stop while shopping where you can enjoy their delicious home-made cakes and a refreshing pot of tea. Clark’s Cafe, 195 Long Street, Easingwold, Yorkshire, YO6 3JB Tel No 01347 821285. This shop started back in 1925 when the Clark’s grandmother-in-law used to make scones and tea and sell it from the kitchen window to road repair men and cyclists. You can see from the displays of canal-wares around the room that the owners enjoy narrow boats. There is also a pretty garden with outside seating for the good weather months. Everything is made on the premises with the speciality being the all day breakfast, ploughman’s lunch and the set afternoon or cream tea. This comes with a selection of sandwiches, scones with cream and cakes and tea. I have just published my book ‘A Little Book on Tea Cake & Chocolate‘, which would make a great gift for anyone who loves tea, cake and chocolate. This little book on tea and cake is a guide about one of our favourite beverages. It explains tea pairings, tea and chocolate, tea and health, tea and sandwiches, fascinating tea facts, buying the right tea, tea to help you sleep and tea cozies and teapots. It also features over one hundred tips on baking cakes and has some recipes for delicious loaf cakes. It finishes with several lovely tea quotes. Over the last three months of spending hours after hours and days after days at the hospital, where my Dad was, I started making notes of some of my posts on tea, cake and chocolate as I felt sure I could use it in a book. There are nineteen chapters which cover all the tea topics I have mentioned above plus tips on how to make the best cake, pastry, and more. I also cover baking apps and recipe books old and new. I finally finished it at the weekend and it is now available to buy as a paperback and hopefully as a kindle read soon. I would love some feedback if any readers bought the book. Preheat the oven to 350°F. Combine the flour, soda, salt, spices and sugar in a large mixing bowl. In another large bowl, combine eggs, water, oil and pumpkin; stir until blended. Combine the wet and dry ingredients, add nuts if you’re using them and mix well. 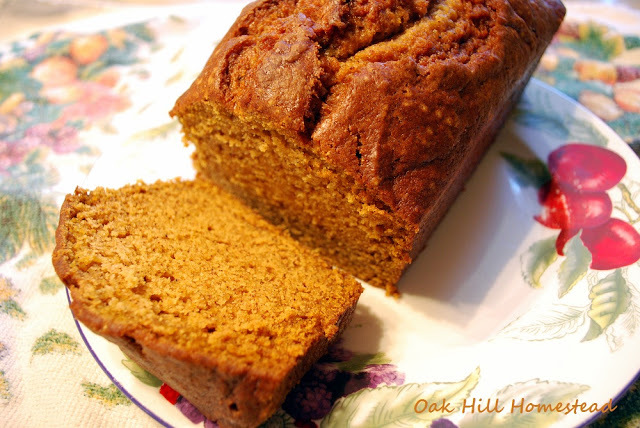 Lightly grease the bottoms of two 9×5″ loaf pans and pour in the batter. Bake for one hour. Test for doneness by inserting a toothpick in the middle of the loaves; the toothpick should come out clean. Cool slightly and take out of the pans to cool completely on a rack. The most popular post I wrote in September was all about soups, Five Reasons Why Soup is the Ultimate Comfort Food. I am sure it was so popular due to the change in the seasons at the moment with Autumn on our doorstep and feeling more like a lovely warm soup rather than a salad seems to tempt us. Nowadays you could just about make any type of soup in a matter of minutes but and you can find an abundance of recipes on the internet but how many of you have a soup maker to cook it in and if so which is your favourite? 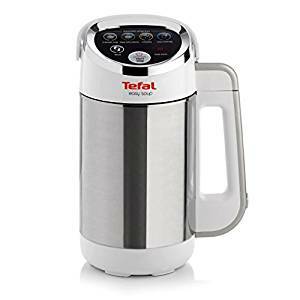 My husband adores making soup and we have gone through a number of soup makers but one he bought recently was the Tefal Easy Soup Maker which we bought on Amazon. It can create different soup texture combinations, also, creates compote and blends without heat and comes with a manual and with a 1 year warranty. We had a Morphy Richards soup maker before for a few years and used it regularly but just fancied a change of dealer this time. Theirs had a 2 year warranty and does all the usual a soup maker does including a motorised blending blade in the lid and was a doddle to clean. 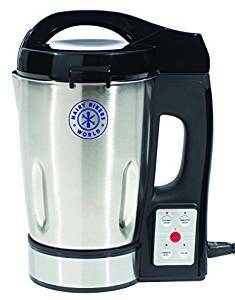 To get the best reviews on soup makers head directly to the Soup Makers Reviews website.which has their 2018 top 10 soup makers table. They have ranked them based on value for money, so if money is no object for you, you’re likely to want to head over to our premium soup maker section for the best of the best. 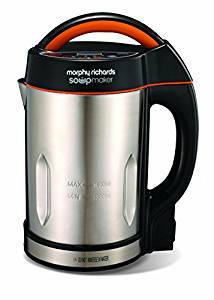 Their number one choice, funnily enough, is the Morphy Richard’s one which I have just written about.